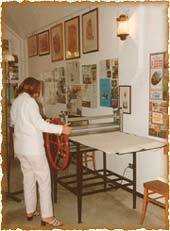 The graphic's works designed and carried out by the artist are: etching and aquatint. 1- A zinc sheet is covered by a thin layer of protective paint and then the picture, which was chosen before is hand etched. 2- The sheet is than dipped in the acid in order that the acid itself could get into the wax made etch and then it could penetrate in the zinc till the wished depth. 3- With the right tecnique the wax is removed from the sheet. 4- Speaking about aquatint: the sheet is covered by bitumen's powder well fixed. The portions, which have to stay lighter, are protected with a special paint. Then different graining's grades, which appear on the surface, are obtained with other immertions in the acid. The sheet is cleaned and inked so that it could give in the print all the chiaro-scuro and colors effects. 5-The sheet is and inked. Then it's stamped on a previously steeped paper with a press. Firsts stamps are carried out in different colours in order to grant to the artist the possibility of finding out the best solution for the piece of work; these stamps are marked with the wording p.d.a. and they could be numbered step by step with roman numbers. In general the stamps are never more than ten and they are the first works in any case: the following stamps, which are arab numbers, have a limited run; this is way after a certain number of stamps, the sheet starts to deteriorate itself so it could not offer the quality the artist asks. For this reason, at the end of the run, which is usually not above thirty stamps, the sheet is "griffata"; that is to say it's barred with an anch cross. Finally every stamp points out in the left corner the progressive number of the reproduction and the total number of the run. 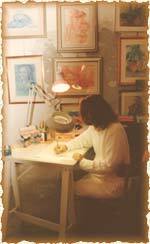 It is also important to point out that the stamp is areal piece of work, it is unique because it is completely hand executed by the artist. So, the one who buy an etching or a aquatint has to be fully aware of possessing not a reproduction of a piece of work, but a part of the piece of work itself.